Lock in a great price for Akrotiri Hotel – rated 9.3 by recent guests! Breakfast was amazing, Maria’s cooking is amazing, views and pool are amazing. The breakfast was very good, every day made different things, and we found plenty of food to choose whatever we like. The berry tart was delicious! The room was clean, they have pillow´s menu :) . The pool was good as well. All the staff were very kind and helpfull, specially Margarita! she was always there to help us to have the best experience in Paros. Walking distance to the city and beach. Amazing view. Nice staff. Transfer was arranged from the port to the hotel and the staff also arranged a rent car for us. The staff was amazing. So friendly and hospitable, like family. I was all around Paros and Greece for a month. This was easily one of the best places I stayed. I loved it. We arrived to a warm welcome on a hot sunny day with a glass of homemade lemonade overlooking the gorgeous pool and city. Our every wish was granted during our stay and the staff made us feel like family. The room was so clean with comfortable modern beds and bathroom and the breakfast was incredible with everything you could think of from fresh fruit, spanakopita, rice pudding, yogurt, chocolate croissants, breakfast breads and toast, eggs, cereal, meats and cheeses, coffee and juice. They even included complementary shuttle service from the port. This is a special place unlike anything you will find. You will be happy with the exceptional service offered here. Thank you for a wonderful stay!!!! The staff is fantastic. Everyone goes the extra mile to make you comfortable. The breakfast is very good as well. We can’t say enough about how much we loved this property. From the staff to the homemade lemonade at a very thoughtful check-in to the food from the snack bar and homemade breakfasts to the adorable rooms and amenities (for example the car rental comes to you! ), it was fabulous and certainly one of our highlights. We really appreciated service by Tereza and Kostas, but every single person we met was wonderful. They went above and beyond all the time. My husband fell coming off of the ferry and Kostas brought all of the supplies he needed to treat his injuries upon arrival. We appreciated being out of the downtown hustle and bustle; the spot has a LOVELY view and pool, no matter the time of day. You could walk to town or restaurants or a cab is like $10. Stay here! We will be back, hopefully with our families. Breakfast, views, location, hosts and staff, socializing area, room’s balcony (lovely!) - everything was great! The hotel is absolutely lovely. The staff are the friendliest, nicest and most attentive staff I have ever encountered in over 15 years of travel. They hotel itself is fantastic, it feels very authentic and has an amazing view of the beach and harbour. The food at the hotel is also exceptional and great value compared to the restaurants in town. I highly recommend and will definitely stay there again :) 10/10! I am travelling often in Europe and have found amazing people but the staff at the Akrotiri Hotel were the most warm hearted, friendliest people I have ever met. I could not believe how friendly staff could attribute to the quality of a holiday experience. Akrotiri Hotel This rating is a reflection of how the property compares to the industry standard when it comes to price, facilities and services available. It's based on a self-evaluation by the property. Use this rating to help choose your stay! Built on the rocks of Akrotiri, Akrotiri Hotel features unobstructed views over Parikia bay. The recently renovated hotel offers an outdoor pool surrounded by colorful gardens with palm trees. Both parking and Wi-Fi are free. 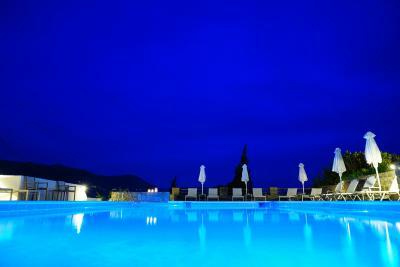 Guests can laze around the sparkling waters of the pool and enjoy breathtaking views over the sea. Krios Beach is just 1148 feet’ walk. 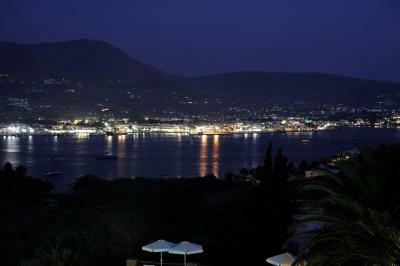 Akrotiri Hotel is located 1.2 mi from Paros’ port. Offering easy access to local bars and restaurants, it is only 0.6 mi from the center of Parikia. Paros airport is roughly 7.5 mi away. Continental breakfast is served each morning at the hotel's restaurant. Barbecue facilities are also available in the premises. The poolside snack bar is open for a drink or a snack. When would you like to stay at Akrotiri Hotel? This room has a private balcony with sea view. This family room consists of 2 interconnected rooms with one shared bathroom. This room opens to a furnished patio. Please note that this room type cannot accommodate an extra bed. This room opens to a furnished patio. This twin room features air conditioning. Located in front of the pool, this room offers views over Paroikia Bay and the pool. House Rules Akrotiri Hotel takes special requests – add in the next step! Akrotiri Hotel accepts these cards and reserves the right to temporarily hold an amount prior to arrival. appeared remote to the town, but was very relaxing. quiet location overlooking the picturesque bay. The staff was great and really helpful, giving us great local recondations for food and beaches. Clean room, big balcony and the view was amazing. The location was perfect as well since the hotel is pretty close to the island’s biggest town. WE RECOMEND IT! It is about a 20 minute walk to the main town of Parikia, however we rented a car (for a very good price) so this wasn’t a problem for us really. The views from were absolutely amazing. From the hotel there is the most beautiful view of Parikia. The staff were really kind and went out of their way to recommend things to do and see in the area. The breakfast was also really good. Room wasn’t ready on arrival and having to wait an hour plus, left a bad taste in our mouths. The receptionist/host came across very disingenuous. We stayed in other places in Pirikia after this stay due to weather conditions/ferry cancellations which were much better value for money. Unlikely to recommend to friends/family. Kostas the bar manager was very kind. Everything! The breakfast was amazing, the staff were friendly and helpful, the views and location in stunning and the pool is so good! Nothing bad, really. Only the road, you better have a car to move, the path to the beach it isnt comfortable. Everything about this hotel was outstanding. After touring around other parts of Europe we wanted a relaxing week and the Akrotiri Hotel was the perfect answer. We loved the views, the staff, the breakfasts are amazing. We will be back for sure. It's the friendliest Hotel we have ever stayed in. With stunning views. A very happy holiday. there were ants in the room (they used some solution but next day they came back), and the bushes are too tall so the view over the city&harbor from some rooms is not that good.